We’ve had a steady stream of visitors in town and I just found out that two more will arrive the second week of June. I wish we had a large house with guest quarters so I could extend my hospitality to all these guests. In fact, shortly after moving here I drew up plans for the house I’d like to build some day. It has a large semi-detached guest suite and a climate-controlled piano room so my parents can come for extended visits and my mother can play. Don’t expect to read any entries about this dream house anytime soon, though. Big Michael has been visiting from Hong Kong this week, returning Saturday morning. A former colleague of mine while I worked in Hong Kong, he’s now a yoga instructor and decided he needed a few days away from the twist and stretch of work. We had a nice time visiting and had several meals together, introducing different friends and making some new connections. I really enjoy when I can introduce different people and help weave a tighter web among people. In my mind, I’m kind of like the Lily Tomlin character of Ernestine the telephone operator (right), smacking my gum and helping people connect. We had dinner Wednesday night at Basillico restaurant on Sukhuvmit Soi 33, below. Always good, it seems that it has become even better as of late with exceptional quality and attentive service. In this day and age that is a good sign, especially considering that at Ta Ling Pling for another dinner Friday night, we were met with spotty, inattentive service, portions that are smaller than before, and more spotty, inattentive service. How many times must a man get up to fill his own water glass? Above from left: Chris, Tawn, Big Michael, Marc, and Wit. 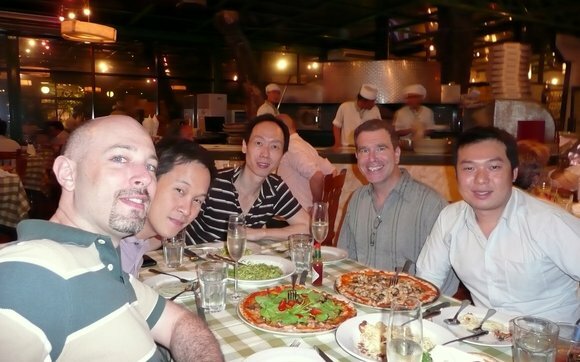 Would you believe that Michael specifically wanted to eat pizza here because he can’t find any good pizza in Hong Kong? This weekend we have several errands to run. For starters, we need to get a jump-start for the car because somebody left the interior light on after we returned home Wednesday night and the battery is dead. No names, no accusations… we’re in this together, right? As has been pointed out to me by several people who came to my blog by way of airliners.net (including this parody by Stipica), I have been remiss in writing and posting reports chronicling my airborne adventures over the past year and more. Starting to catch up, I have finally posted the full trip report from the elaborate March 2007 trip Tawn and I took that included long layovers in Nartia, Toronto and Hong Kong as well as official stops in San Francisco and Kansas City. The first part of the trip report is here and the second part of the trip report is here. More airplane geeky than travelogue, although with additional detail about the stop in Narita town in Japan. 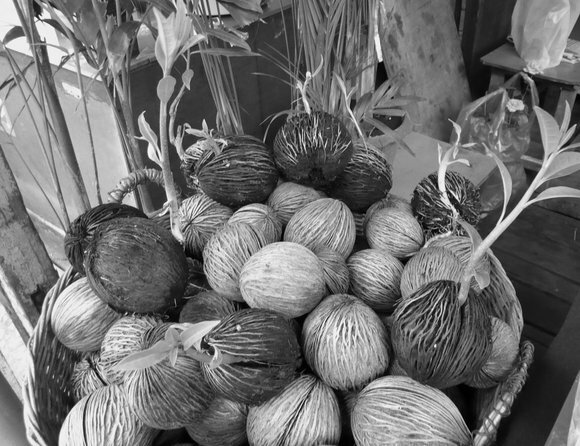 After some political interruptions, let’s return to the second part of my trip to the land of honey – the literal translation of Bangnamphung, the location of the nearby weekend floating market. 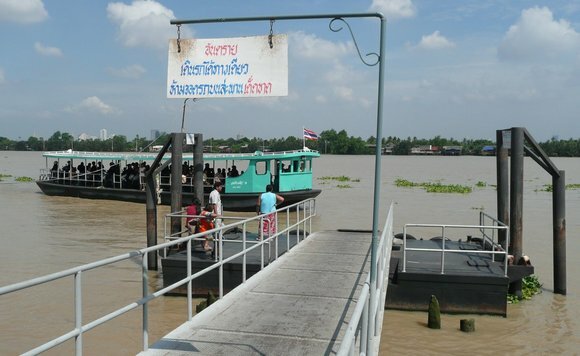 The floating market isn’t really a “floating” market. 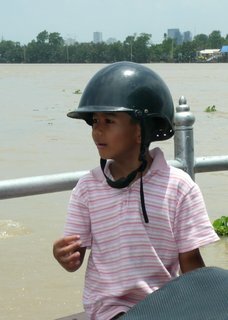 Instead, it is a weekend market built alongside the khlong (canal) that may have at one point years ago had some vendors in boats but which eventually was developed by well-meaning local officials into a destination for local tourists. It is still a fun place to visit, but isn’t the quaint local market that you might envision. Still, there aren’t too many foreigners there. I did see one other but I pushed him into the water so there wouldn’t be any competition. Some areas of the market sell crafts and products, others sell fresh fruits and vegetables, but most of the market space is dedicated to prepared foods. 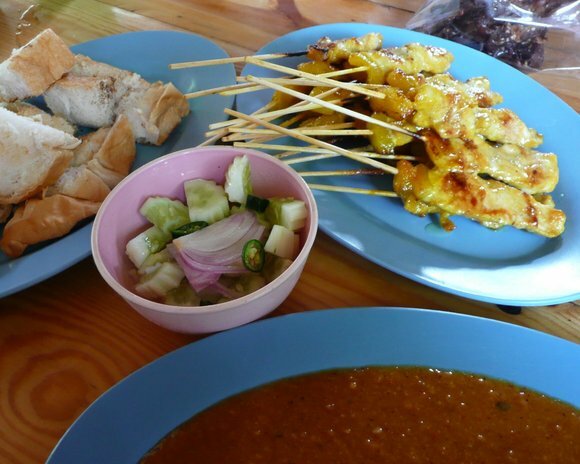 This is because, as any Thai will tell you, there is absolutely nothing more fun to do than eat! Eat in a group and you’re in an even higher plane of heaven. 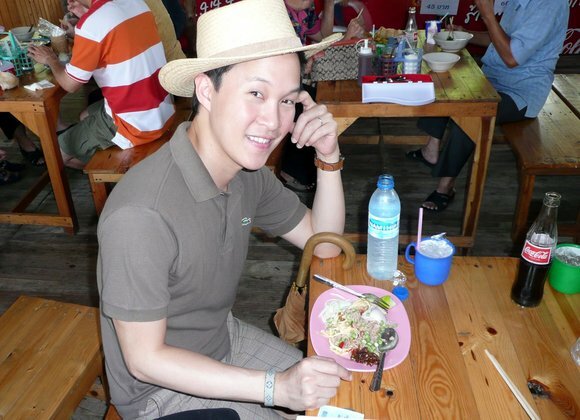 Below, Khun Tawn borrows my straw hat as he prepares to chow down. Here’s one of several vendors grilling the delicacy, proof that you can eat pretty much every last part of a duck except the quack. And did Paul try one? Despite the pose, I wouldn’t count on it! 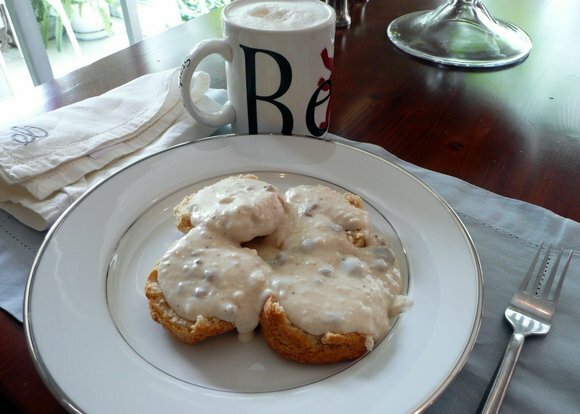 Aori, however, thinks they are the best thing in the world, or pretty darn close to it. They taste smoky and the beak is edible albeit crunchy. 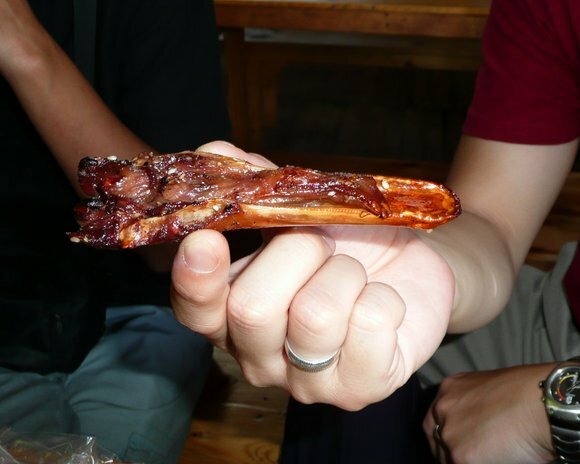 The tongue (still intact) is supposed to be the best part. As my paternal grandmother used to say, to each his own. Moving on to other delights, we have hoy tod or fried mussels. Normally fried in a batch with scrambled eggs, this vendor did a little play on tradition by frying an individual mussel in a half-moon shaped khanom khrug pan with a little egg to make versions of the original dish. Tawn didn’t feel like it was an improvement. 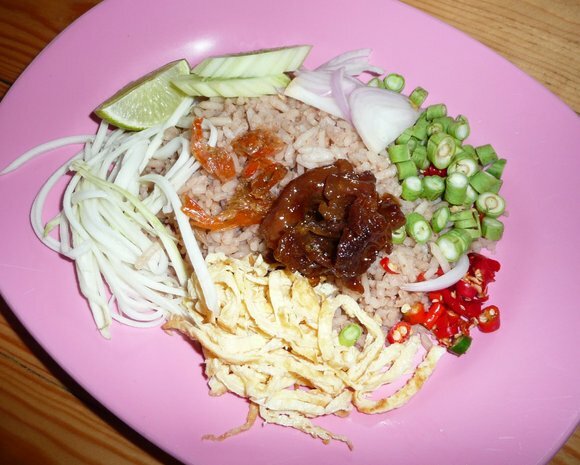 We also had some khao klug gapii, friend rice with shrimp paste served with a variety of condiments including lime, cucumbers, shallots, green beans, chili, scrambled eggs, green mango, dried shirmp, and sweet and sour pork sauce. 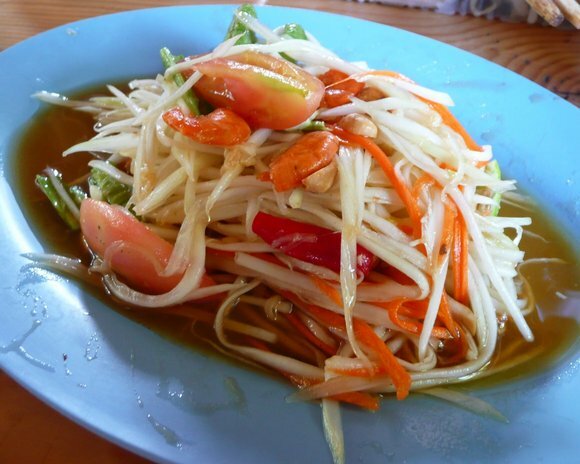 Turning to some more traditional Thai foods, here is som tam, the ubiquitous green papaya salad that is crunchy, sweet, vinegary, salty and spicy all at once. 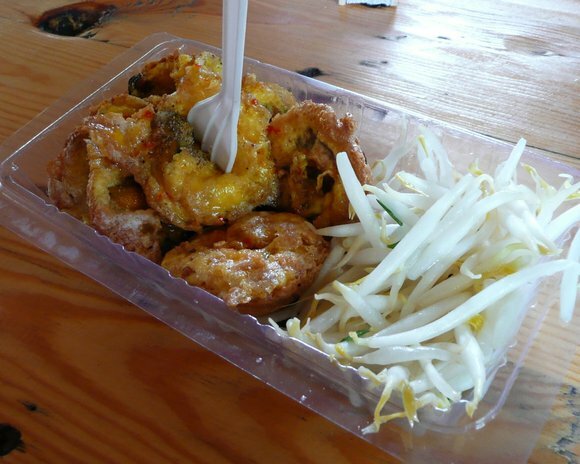 A fixture of northeastern Thailand, it has been adopted by Bangkokians as a de facto official dish in part because so many people who live in the Big Mango are from the northeast of Thailand. 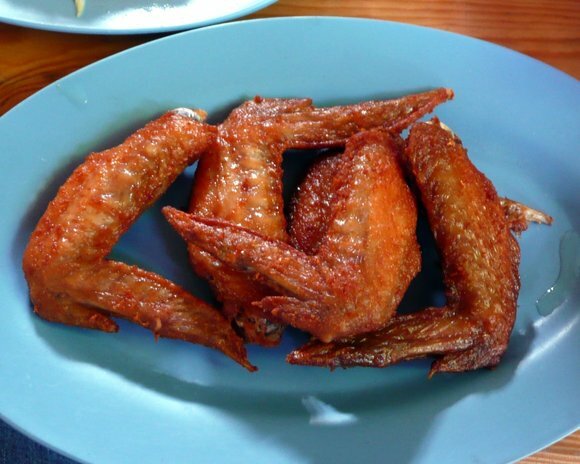 Something you can find in nearly every culture, fried chicken wings. I don’t know what they use to season them, but these were incredible. Our little culinary tour included some flavors of Muslim Thai food, predominately from the south of the Kingdom but brought into the local culinary lexicon by the many small pockets of Muslims who live in and around Khrungthep. Here is gai satay, chicken skewers served with a peanut sauce. The onions and cucumbers, pickled in rice wine vinegar, provide a clean contrast to the sweet richness of the dipping sauce. 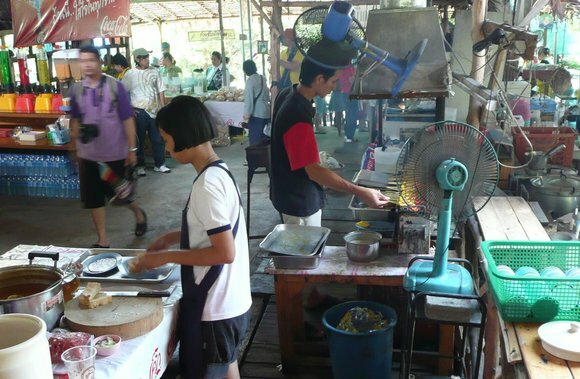 Below, the satay vendor prepares an endless supply of satay served with toasted white bread. Note the way the fans are rigged to blow the smoke and smell away from the tables but towards potential customers. The tables were tightly nested together and this young man behind us almost had to climb over us to get out to buy some ice cream. 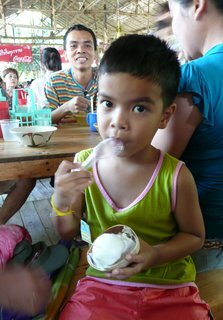 This homemade ice cream is made from fresh young coconuts that are locally grown with the scoops served in pieces of the shell that still have shreds of the coconut flesh attached. Chatting with his family, they encouraged him to try speaking whatever English he has learned in school, but I couldn’t get so much as a “hello” out of him. 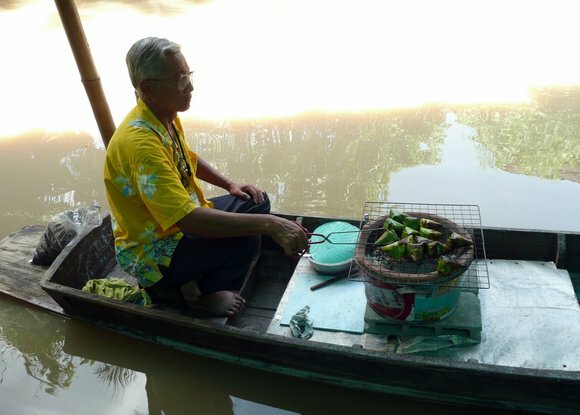 Below: Yes, there is actually something floating at the floating market. Here a vendor grills khao niyaw ping, literally “grilled sticky rice” wrapped in a banana leaf and filled either with baked taro root or baked banana. 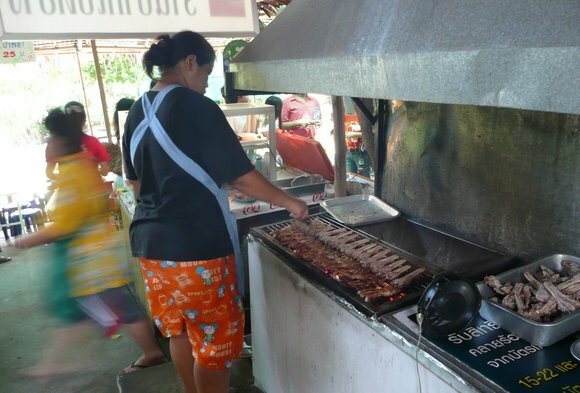 Actually, the guy doing the grilling is the husband of one of the ladies sitting at the stall onshore and conducting transactions. How he got stuck in the boat, I don’t know, but at least he was in the shade and there was a little breeze along the water. 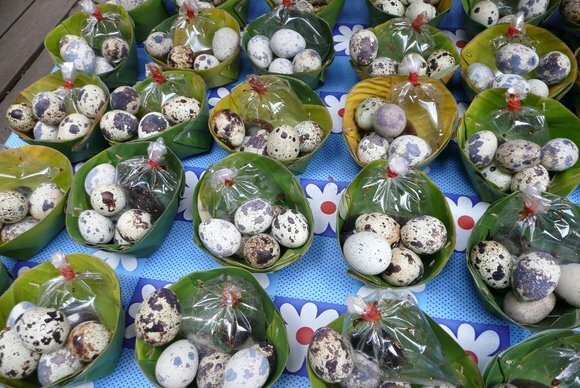 One final food item was kai nokgrata nam siiyuu, grilled quail eggs (they are boiled first otherwise they would take forever to cook on the grill) served with soy sauce. 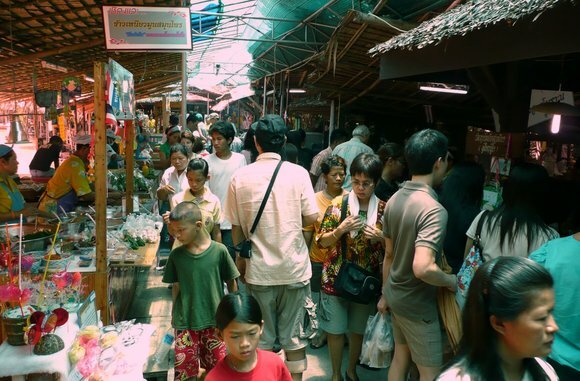 After eating our fill and far beyond it, we wandered around the market to see what else was interesting. We saw these seed pods called teen bet naam, which look like something out of a sci-fi movie. Here I am standing on one of the concrete pathways built above the marshy ground. The market also included a park area with public karaoke. Anyone was invited to sing and, judging from Tawn’s reaction below, greater discretion should be used before people go on stage and inflict their voices on others. 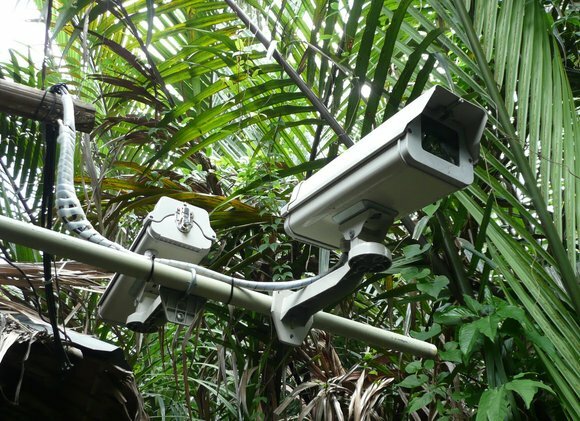 Despite the lush local atmosphere, the latest security systems are installed to help the police keep an eye on all corners of the market. 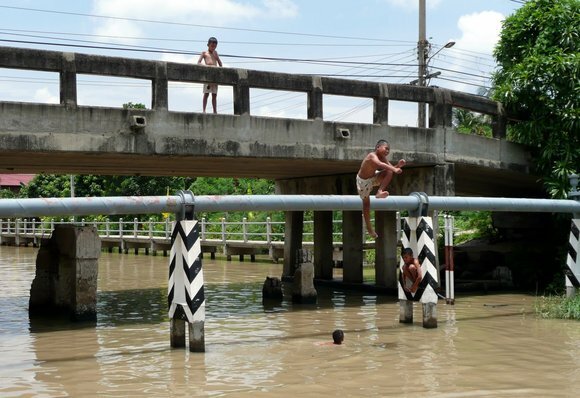 Walking back along the khlong to the main road where we would catch motorbikes back to the pier, we saw a group of local children playing in the water and diving from the bridge and the water pipe. Once I started taking pictures and they saw they had an audience, all sorts of derringdo ensued. Lovely helmet, huh? I can’t imagine what good it would do him on the back of a motorcycle but it is the thought that counts, right? Whoops! That was very “naive farang” of me. 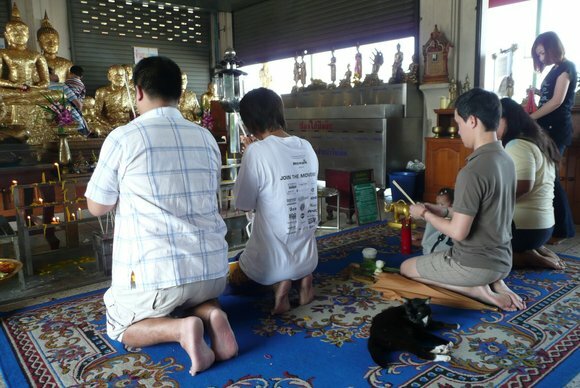 I should let Thailand be Thai. That concludes our trip to the land of honey. And, I’ll have you know, I did return home with two bottles of unpasteurized local honey to add to my morning oatmeal. Hello, may I speak with the Governator, please? There are any number of urban legends circulating via email, so I was especially amazed to receive one today that is actually true. I called the number myself just to make sure, after searching extensively online at snopes.com and elsewhere to discount it. The Governor of California’s website (http://gov.ca.gov/) indicates that the number listed in the email is the public number for the Governor’s office. California Supreme Court decision overturning the ban on gay marriage. Most of the response they are getting is in OPPOSITION to the court action. After you’ve done this, please send it on to all supporters you know. There were probably some additional hot issues but I didn’t listen that long. After choosing “1” for the recent state supreme court decisions allowing Tawn and I to finally be legally married in the State of California, although it won’t give us any federal rights such as immigration, I had the option of pressing “1” to show my support for the ruling or “2” to show my dissatisfaction with it. Of course, I chose number one. There is just something incredibly funny about this whole thing. It says so much about our level (or lack) of participation in an ostensibly participatory democracy. We can’t be bothered to write a letter, let alone an email. Pressing a total of 15 buttons is all the effort we can take to express our opinions on political matters. At the same time, especially if you’re in California, I’d appreciate you giving Arnold a call and letting know how you feel. He’s already stated that he does not support the proposed constitutional amendment that is designed to overturn the court’s ruling, which will be on the November ballot. 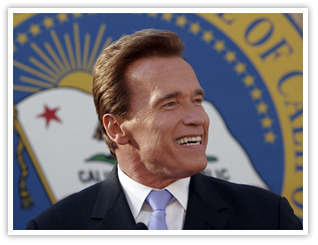 As a moderate Republican, Arnold’s support is very valuable to the cause of equal rights for gays and lesbians. Still, this is a very surreal way for the public to get involved in politics, isn’t it? Is sticking a knife into someone positive or negative? To read the rest of this thoughtful article, click here. Saturday morning Tawn and I joined Aori and Paul on a trip to the floating market at Bangnamphung (literally, “The place of honey”) in Phra Pradaeng. It has been the better part of two years since I last wrote about Phra Pradaeng. 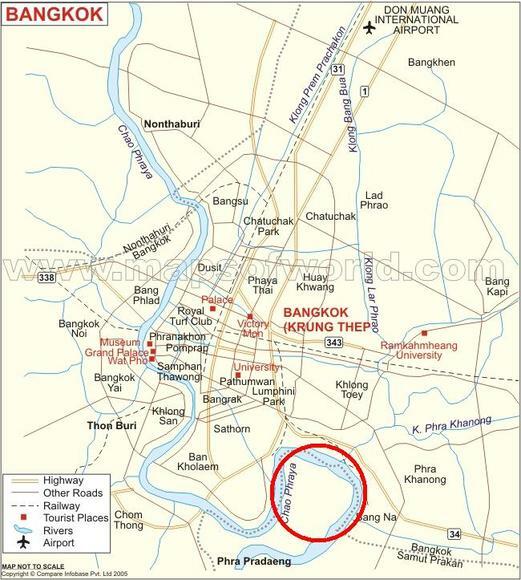 It is a near-island created by an excessive bend in the Chao Phraya River, somewhat to the south of the main part of the city. Unlike all the surrounding areas, Phra Pradaeng has undergone minimal development and is mostly covered with banana and coconut plantations. A fantastic place to ride a bicycle, it has more in common with the countryside on the outskirts of the city than it does with the industrial area, port, and financial centers that lie just across the river from it. 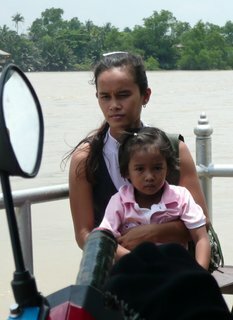 We drove down to Aori’s house in Bang Na to pick them up, then continued to a temple at the edge of the river. 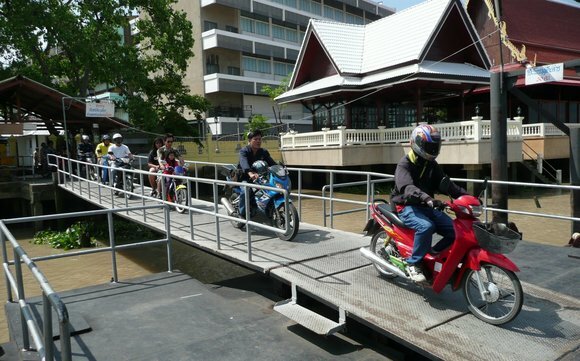 Parking at the temple is ostensibly reserved only for people coming to the temple – the signs specifically say there is no parking for the floating market. So we spent some time at the temple first, feeding the cows and water buffalo, praying to the Buddha statues, and donating some money. This is the first temple I’ve seen that have farm animals. They are there to be donated to needy families in the countryside and you can make a donation and feed them. It was a regular petting zoo although, as Tawn found out, the cows don’t like you to touch their foreheads, above. The sala or pavilion was right next to the river, open on both sides and enjoying a pleasant breeze. 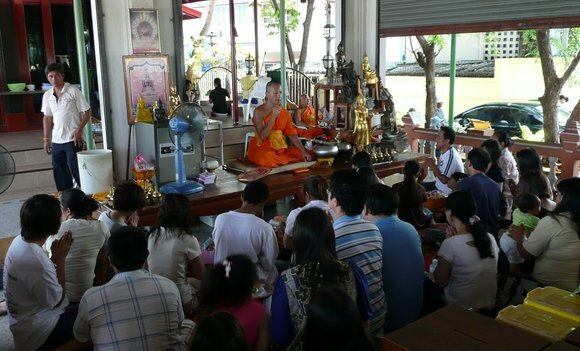 Dozens of adherents were coming and going, making offerings, receiving blessings, and prostrating themselves before the images of the Buddha and several revered monks. I found it curious that this cat was just lying on the carpet, above, unconcerned about all of the people coming and going around him. A large family arrived all at one in two vans to receive a blessing, above. The monk, in order to be heard, was holding a small microphone – a very modern addition to an ancient ceremony. 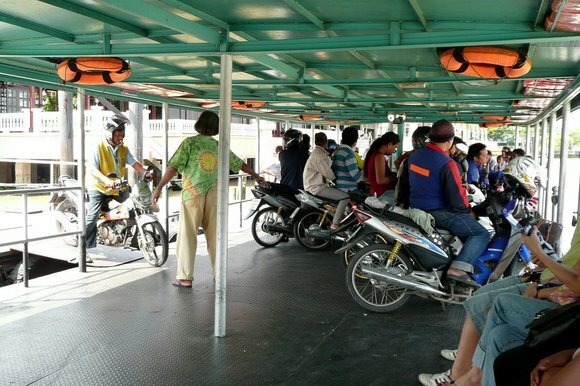 The ferry runs about every twenty minutes and carries a lot of traffic across the river, including a lot of motorbikes which are the primary form of transportation on Phra Pradaeng. This is a well-organized system with pedestrians first, followed by motorbikes, then any bicycles. A recording plays just as the boat is landing with a little patriotic music and then announcements about the embarking and disembarking procedures. It sounded more like an amusement park than anything else. Once we were seated onboard, a stream of about two dozen motorbikes followed us on, above, directed into the correct place by the deck hand, below. Even on the hottest days, there is a nice breeze on the river. 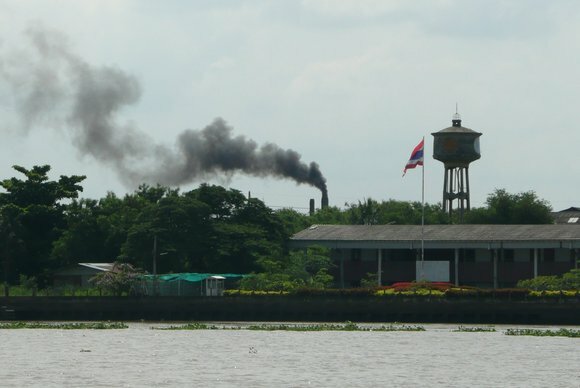 As we worked our way across and slightly up the river, we had a good view of part of the Khlong Toei port area, where all of the oil products are off-loaded. There are numerous industrial plants and factories in this area. I’m curious what will happen in the next few years as the Skytrain extends into this end of town and more and more condominiums and residential developments drive up the land values. Will the factories move and will the area gradually be rezoned? Thankfully, this polluting smokestack was only running for a short while. When we returned later in the afternoon, the sky was much cleaner. 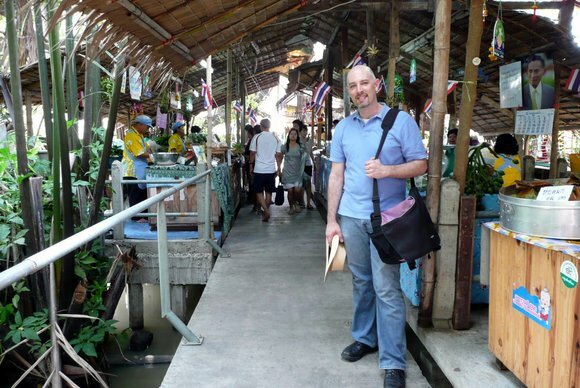 Just how “farang” shouldn’t I be? When I write these entries, I also post a link to them on my Facebook account because I have many friends who don’t regularly read my blog. (As opposed to the many regular readers of this blog who have become friends.) 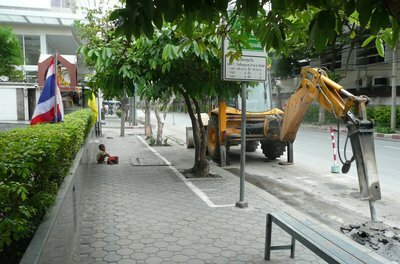 On Saturday I wrote an entry about this little boy, pictured right, playing on a sidewalk while his father operated very loud construction equipment nearby. I wrote that two of the questions crossing my mind were why the boy was sitting there and why nobody had any hearing protection on. I didn’t rail against the injustices of the situation, demand that Thailand change, or harumph about how superior things are in the west. I simply wrote that those were questions that crossed my mind. I’m not sure what qualifies my thinking as that of “a novice farang” nor what I did to suggest that Thailand shouldn’t be Thai. Was I being culturally insensitive to suggest that the loud noise could cause hearing damage to the young child and his father? Was I being too “western” to wonder why they didn’t have any hearing protection on? It seems to me that concern over the wellbeing of people, especially children, is a pretty universal value and not one that I should grow out of the longer I live here. Maybe there is another stage of thinking after novice farang: “jaded expat”. The jaded expat sees the lives and wellbeing of the locals as disposable commodities since he won’t be living here in five, ten, twenty years to deal with the long-term effects.